SAILKARMA.COM - Sailing News, Videos and Photos! : GREENBIRD SMASHES WORLD RECORD!! 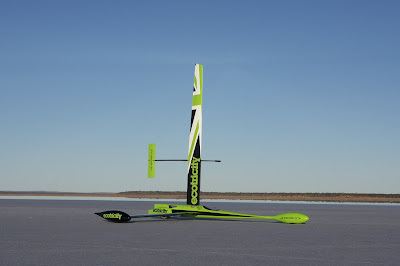 On the morning of March 26th, on the ‘dry’ Lake Ivanpah, The Ecotricity Greenbird driven by British engineer, Richard Jenkins smashed the world land speed record for wind powered vehicles. The Greenbird clocked 126.1 mph (202.9 km/h) , eclipsing the old, American held, record of 116 mph , set by Bob Schumacher in the Iron Duck in March 1999 at the same location.